HSE Graduate School of Urbanism and the Institute for Advanced Architecture of Catalonia are launching a joint project the VDNKh Laboratory of the Future workshop, resulting in works to be presented inside the Russian Pavilion curated by the Chief Architect of Moscow Sergey Kuznetsov, during the 15th Architecture Venice Biennale. 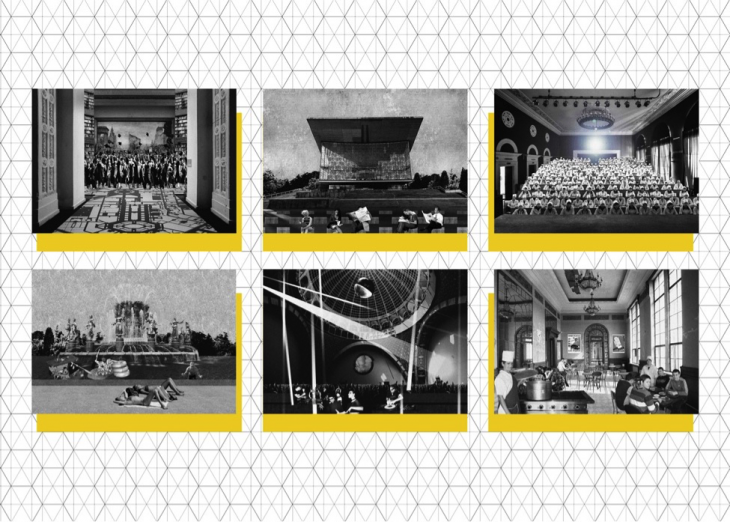 This year the Russian Pavilion focuses on analyzing the history and proposes a future for the VDNKh Expo Park of the Exhibition of Achievements of National Economy, which began its construction in 1935 and had its major development take place in the 1950s. Today, the territory similar in surface with that of Monaco, has historical buildings and a large amount of unoccupied space and is in need of a new vision for its future development. During the workshop the participants were given complete freedom of expression regarding their visions of the future of VDNKh, and after a few inspiring group exercises the 12 participants started their individual works. Under Vicente Guallart’s guidance and curation, 27 original works were selected out of the nearly 40 proposals done by the participants. 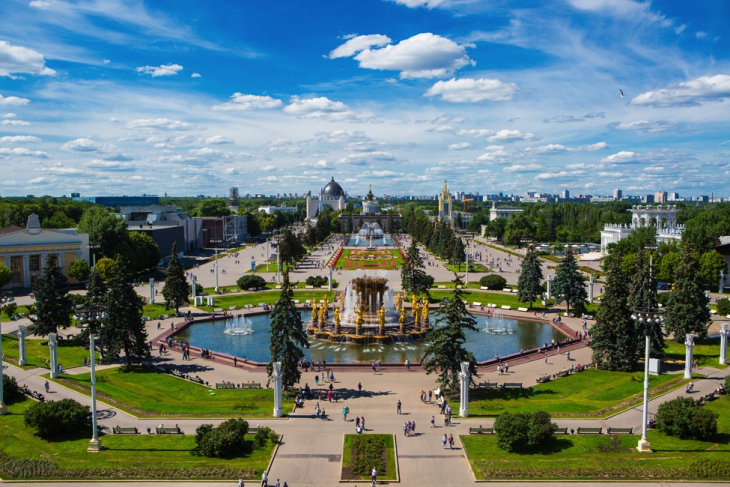 There were three main directions that were taken, one was focused on the interior spaces of the pavilions, one on options for the entire territory and one on abstract concepts related with the art and heritage of VDNKh and the Russian culture. 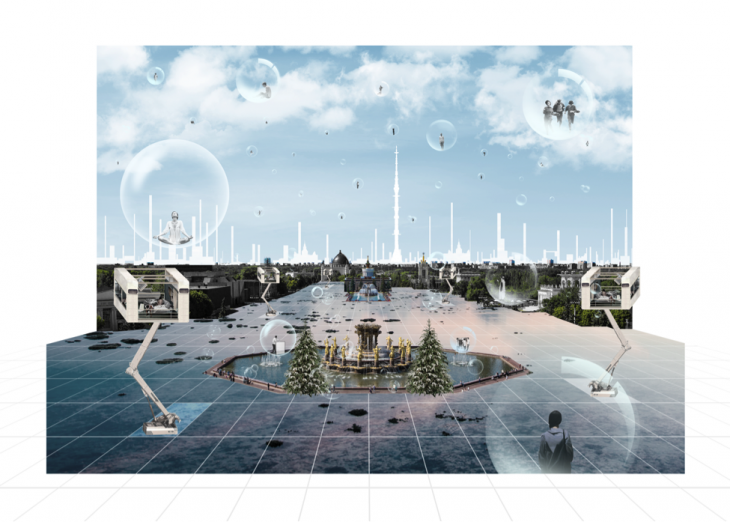 IAAC Student Juan Diego Ramirez Leon proposes a tabula-rasa for the territory of VDNKh, in a future where the space is populated by floating tranquil spaces projected upon a densified Moscow. 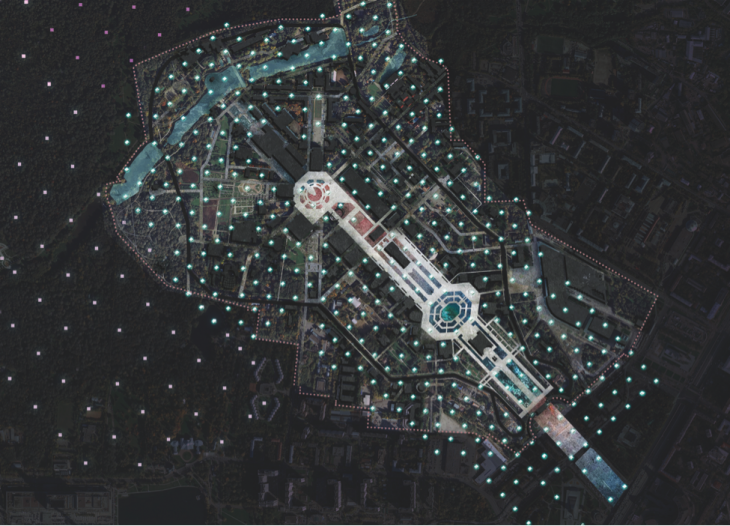 HSE student Irina Shmeleva had a more feasible proposal for VDNKh, converting it into an academic campus showing different instances of the student activity. 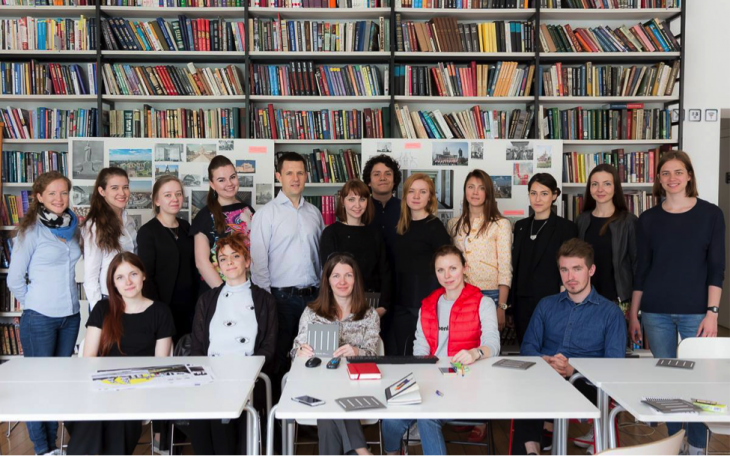 IAAC Student Ksenia Dyusembaeva has a radical vision on the issue of preserving the heritage and patrimony of VDNKh by not touching any of the existing buildings and proposes the developing of underground productive structures. 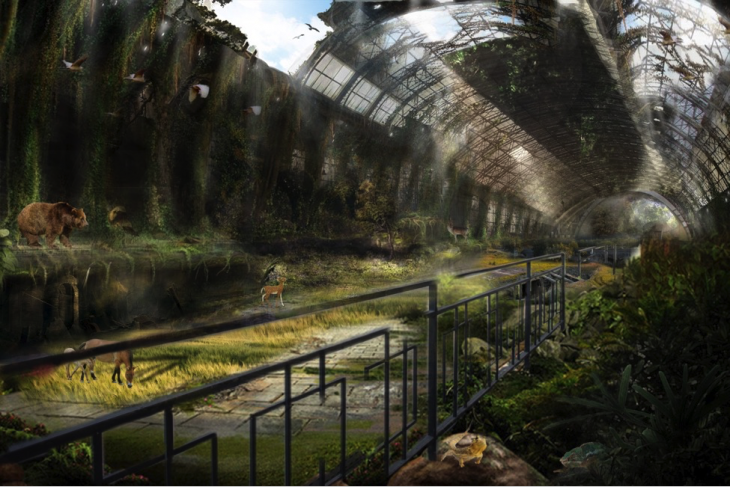 HSE student Natalia Chernobrova explores the dystopian future of VDNKh, abandoned to the will of nature, slowly decaying and converted into an animal habitat, like a temple of a distant past. 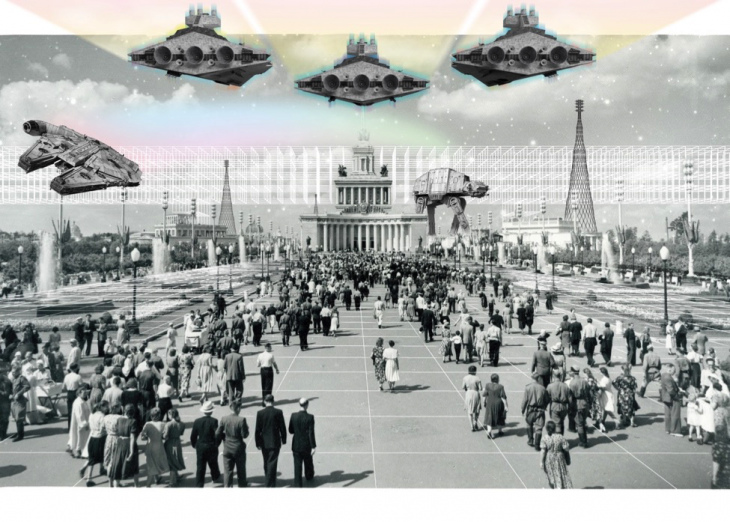 IAAC and Strelka alumni, Rodion Eremeev proposes a conceptual attack of the future on VDNKh. 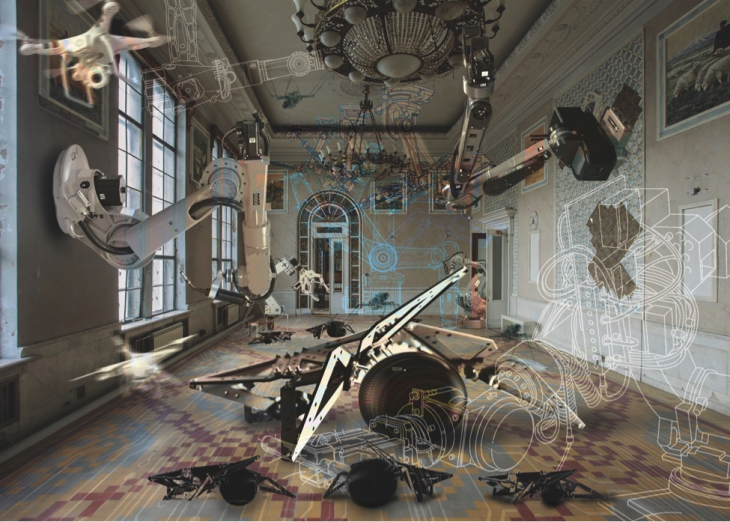 IAAC Alumni Ruxandra Iancu proposes a future where mankind is irrelevant, a future in which all the relics of man are used by the machines to build their own version of the future. 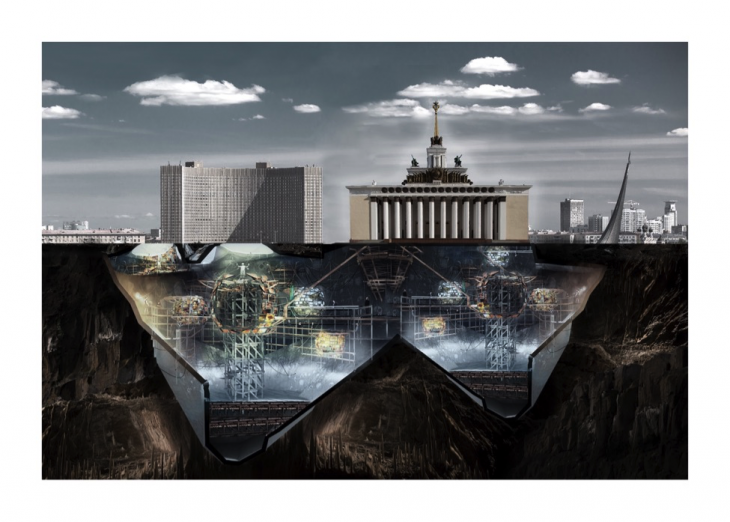 HSE student, Ekaterina Goncharova proposes the conversion of the VDNKh territory into the Moscow Art District, attacking the existing plan, building and road network of the space with an orthogonal disposition of key art pieces. 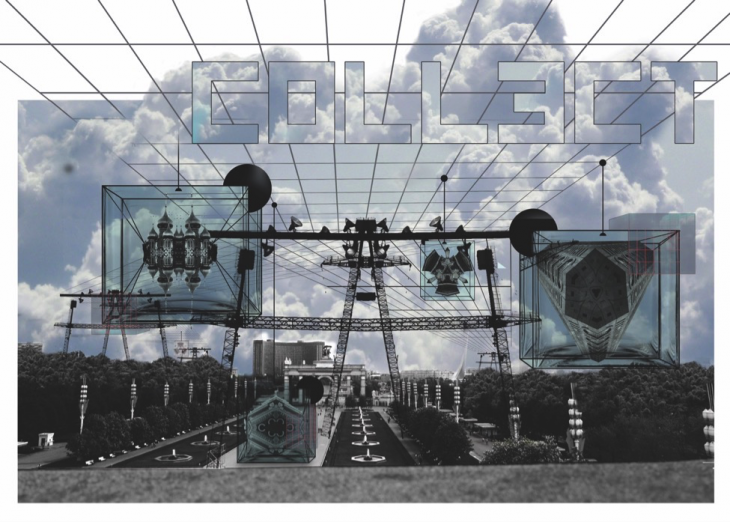 IAAC Alumni Ece Tankal proposed a connection between the center of Moscow and the VDNKh territory through an elevated mega structures that allows the collection and temporary storage of elements from one side to the other. All the works can be viewed in Room 5 of the Russian Pavilion at the 15th International Architecture Exhibition in Venice on Saturday 28th of May when the exhibition will be open to the public until the 27th of November 2016. Participants: Natalia Chernobrova, Ruxandra Iancu-Bratosin, Sofia Paymanova, Ksenia Dyusembaeva, Ksenia Ermakova, Juan Diego Ramirez Leon, Valentina Maksimova, Ece Tankal, Irina Shmeleva, Liva Dudareva, Ekaterina Goncharova, Rodion Eremeev. Organizers: Vicente Guallart, Alexei Novikov, Vera Leonova, Marina Dubova, Katya Dyba, Nadia Kort.